Vishal Narsinghani has made IIM Trichy proud by being the second runner up of the CBC CXO Challenge. Here we are, in a freewheeling chat about his experiences as a participant. Hi Vishal ! Could you give a brief about the competition? Hi ! The CXO Challenge has fierce competition. More than 3000 students across top B-Schools participated in this competition. The Phase 1 of this challenge included 4 rigorous rounds. They test Quantitative and Reasoning capabilities, your MS Excel skills, estimations and efficiency in solving managerial complexities…and this includes asking the right kind of questions. The top 10 candidates moved to Phase 2 where they were given 2 weeks to present customer – centric solutions online (15 min presentation + 10 min Q&A) on a case which demanded research on digitization, analytics and the industries relevant to the case. The finale, Colloquium was attended by top level executives and CXOs to apprise all the participants, PPO holders and B-School professors about the current trends in the industry. The participants had to pitch their findings in 3 minutes followed by another round of Q&A. The winners were decided on cumulative scores from phase 2 and colloquium (finale). That certainly seems to be grueling. How is it different from other competitions that you have participated in? In Phase 2 of CXO Challenge, the top 10 contestants were assigned mentors, who are at director level positions in CBC. This is the most important part that differentiates CXO Challenge from other competitions. Their guidance is what catalyzes the conversion of a participant from student to consultant. The other difference is that it is an individual level challenge. You get an opportunity to showcase your talent; all the eyes are set on you and you only. You have to move out of your comfort zone and work on your weak spots as there is no one to cover up, unlike a group event. What was the most difficult part of the competition for you? How did you get through it? The case was intimidating in the first look, mainly because it was about a sector that I was not much inclined towards. It required extensive research on not just on the sector, but also the related industries and segments. Also, the presentation needed was a level beyond what we usually make in class projects. A majority of my time went into making the presentation slides. Striking a balance between studies, competition and extra-curricular was another difficulty. I had to prioritize my tasks and cut down the redundancies from my schedule. My days started with lectures, afternoon went into finding facts, evenings into building strategies and nights into making slides. So, how was your overall experience? Phase 2 was an amazing learning experience. I got an opportunity to research about various segments of the automobile industry, NBFCs in India and analytical practices followed in these industries. The Finale was like a mixture of work and play for me, the venue was in Bangalore. Win or not, partying was a given. 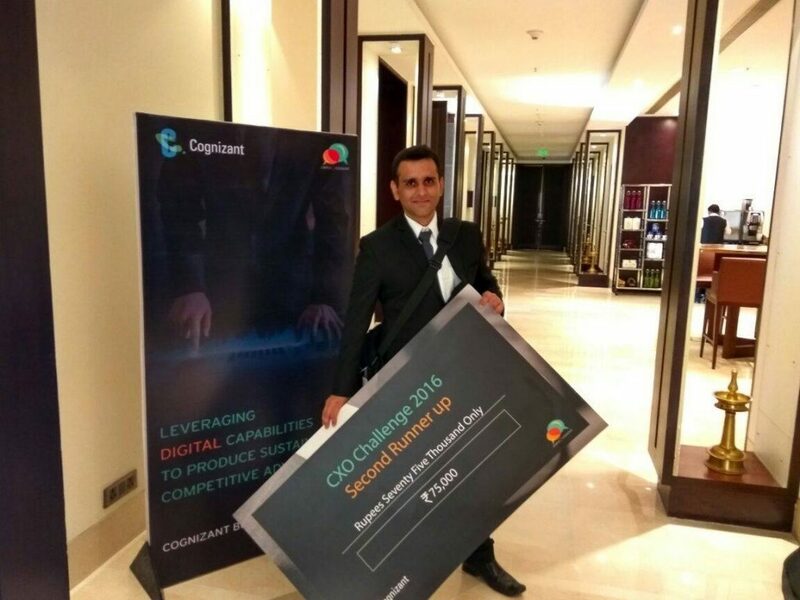 Do you have any tips for future aspirants of the Cognizant CXO Challenge? Yes, there are some important things that I learnt. They may seem small, but keep this in mind when you are participating. Phase 1: Keep a pen, paper, calculator ready before you start the rounds. Phase 2: The implied requisite here is to analyze the case from a consultant’s perspective, in light of the services CBC offers. Try to have maximum and meaningful interaction with your mentor in Phase2. Be ready with your doubts/questions before speaking to your mentor. Speak to the professors, FPMs to gain insights. Content and speech are equally important. Relying on just one won’t get you there. And the most important one – Anticipate the Q&A round questions. Present your findings to the right people, who can critically analyze your presentation. This will help you in getting an idea about what the kind of questions that can be asked. Prepare well for them. Finale: Time your speech well, and do multiple practice rounds . The content and the way you present it are equally important and would improve your scores. Keep your ears open before your final presentation, I got cues for my Q&A answers while participating in discussions with CXOs an hour before my pitch. Vishal Narsinghani completed B.E. in Electronics and Telecommunication from Mumbai. He has work experience across domains like Insurance, Telecom and Media for technology services and solutions. He is the Treasurer of Cultural Committee and the Club Coordinator for Enviro Club in IIM Trichy. He enjoys playing Chess and Chess Team Captain of IIMT for Sangram, intercollege IIM sports fest.